And just like that, the final week of the 2018 Miss Cryptid Contest is upon us! 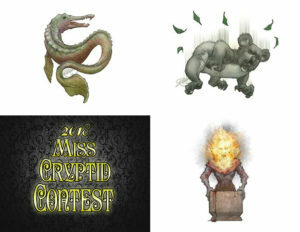 Georgia’s river monster, the Altamaha-ha, the Caribbean’s fire hag the Soucouyant, and Australia’s treetop assassin the Dropbear are the last 3 contestants to grace the 2018 Miss Cryptid Contest stage. These lethal lasses saved some pretty powerful performances for the end. Land, air and water are all covered, meaning there’s nowhere to hide from these terrors this week. Who will you choose to come out on top and move on to the finals for a chance at the coveted Golden Goatman Trophy? Make sure to head over to blurryphotos.org and cast your vote today! You can also enter for a chance to win a prize pack of your own. Flora also announces the winner of Week 2 in this episode. Special thanks to Alyssa, Sammy, and Graham from ‘Straya for their help with this one! Miles, Jim. “Weird Georgia.” Sterling Publishing. Apr. 24, 2006. Pg. 77. Gibbens, Sarah. “Mysterious Sea Creature Washes Ashore, Stumps Scientists.” National Geographic. Mar. 21, 2018. Web.